The quietest place on earth is a laboratory in South Minneapolis, at Orfield Laboratories. 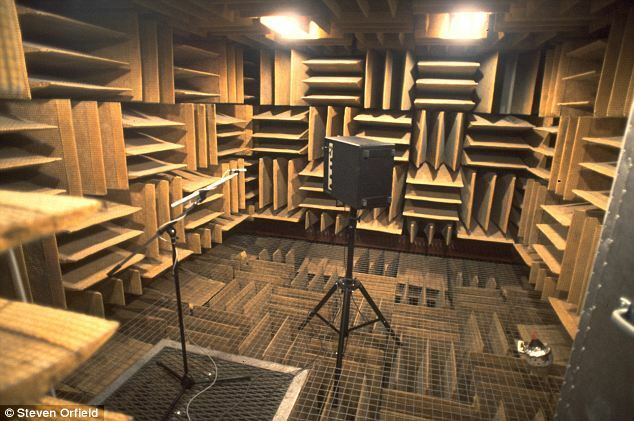 The room cancels 99.99 percent of all sounds and is the present holder of the world record for world's quietest place at an ambient sound level of -9.4 dBA. While the room is typically used for product testing (to measure the level of sound emitted from LED lightbulbs or cell phone screens), people are also allowed to sit in the room to experience the lack of sound. The room, through the use of sound-absorbing material on all its surfaces, is so quiet that a person inside can hear their heart, stomach, ears, and other internal organs. The experience is disorienting, and anyone who wishes to spend an extended period of time in the room must be seated to prevent the person from falling over. The longest anyone has spent in the room is 45 minutes, and the creator of the room himself has only spent 30 minutes in the room.